Yesterday was a “heavy-hearted” day. A dear friend lost her sister. Also yesterday, another friend lost his mom. Last night I drove my husband to the airport, after receiving word of his father’s “dire” condition after suffering a heart attack. Three of my husband’s sisters have had surgeries or hospitalization for illnesses over the last month. Another friend is having trials in her marriage. A scripture in John 16:33 comes to mind. Friday night, (Nana and Papa night), I was privileged to meet a butterfly named Sweetheart. My grand-daughter, Emma, brought her over to our house to continue to care for her. About three weeks ago, this deeply compassionate eight-year-old found the injured little insect on the ground. 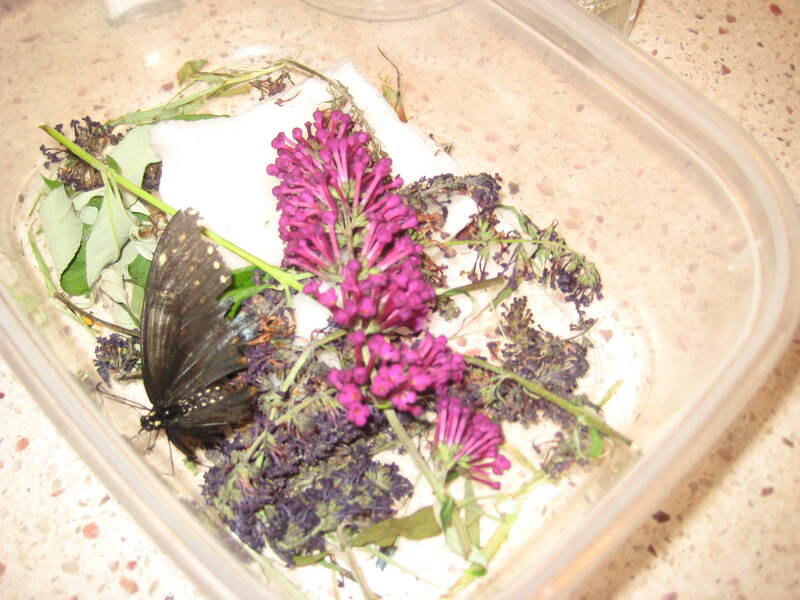 Noticing that it had only one wing and could not fly, Emma brought it in and made it a home in a tupperware container. She named it “Sweetheart” and surrounded her (Emma somehow knows it’s a girl) with grass, twigs and other plants which she learned were pleasing to butterflies. Every day she takes it outside to drink sweet nectar from a “butterfly bush”. This little butterfly has already outlived its normal life expectancy. It has survived, and dare I say thrived (living with one wing and sitting in a tupperware container), because of the tender compassion of my granddaughter. As I think of my trials, and also as I pray for those who are particularly hurting today, I picture one- winged “Sweetheart” being gently lifted onto the nourishment-giving nectar of the butterfly bush. And she thrives. I then remember one of my favorite scriptures. Whether or not we are able to “fly” today, may we all feel the strong arms of our Father’s compassion– and thrive.